Recently I was contacted by the Swedish watch company, Daniel Wellington. They asked if I would like to try out one of their watches and share it with all of you! After looking through all of their beautiful designs, I really fell in love with their Classic Southampton watch. 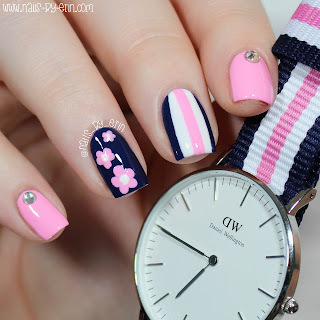 I created this nail design to match the navy and pink band of the watch! The color scheme of this watch is exactly my style! I love navy blue, and I always want a slightly girly touch. 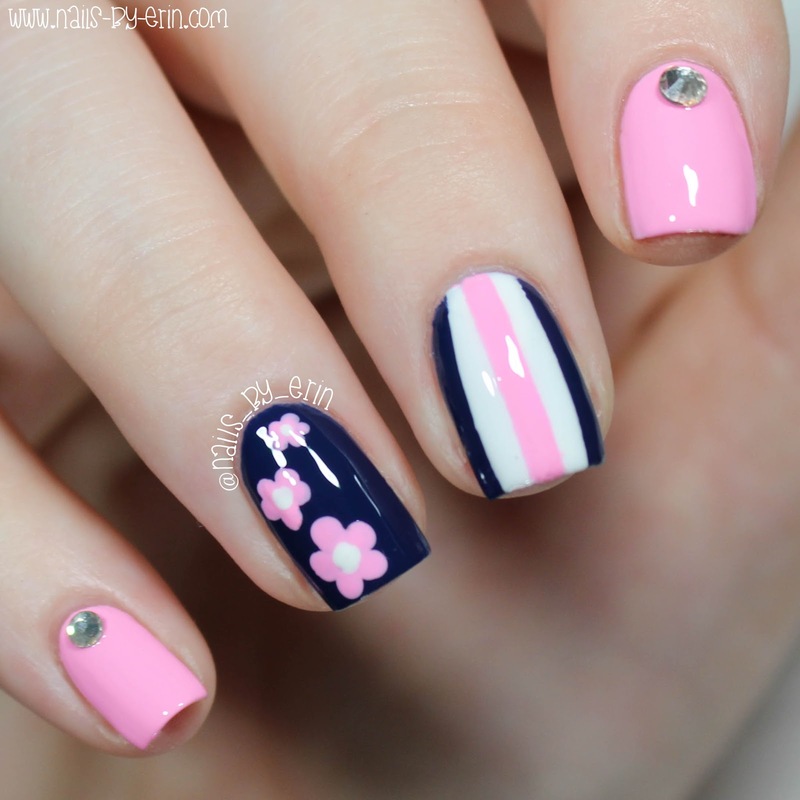 The navy blue and the pink perfectly balance each other out. I chose to get the silver version of this watch, since most of my jewelry is silver, but it also comes in rose gold and it is gorgeous as well! I have to admit; I've never really worn a watch regularly before, so this was a nice change for me! I love the style of this watch a lot and I can definitely see myself wearing this all the time. Now, onto the nail design! I wanted something that would compliment the design of the watch band while still being fun and girly. I used Floss Gloss "Perf" and OPI Infinite Shine "Get Ryd-of-thym Blues", which matched pretty well to the colors in the watch band, if I say so myself! :) I also had to add a little bit of bling, of course, so I placed a silver rhinestone on each of my plain pink nails. You guys might remember this floral pattern from my Floral Watermarble Nails that I did a few months ago. 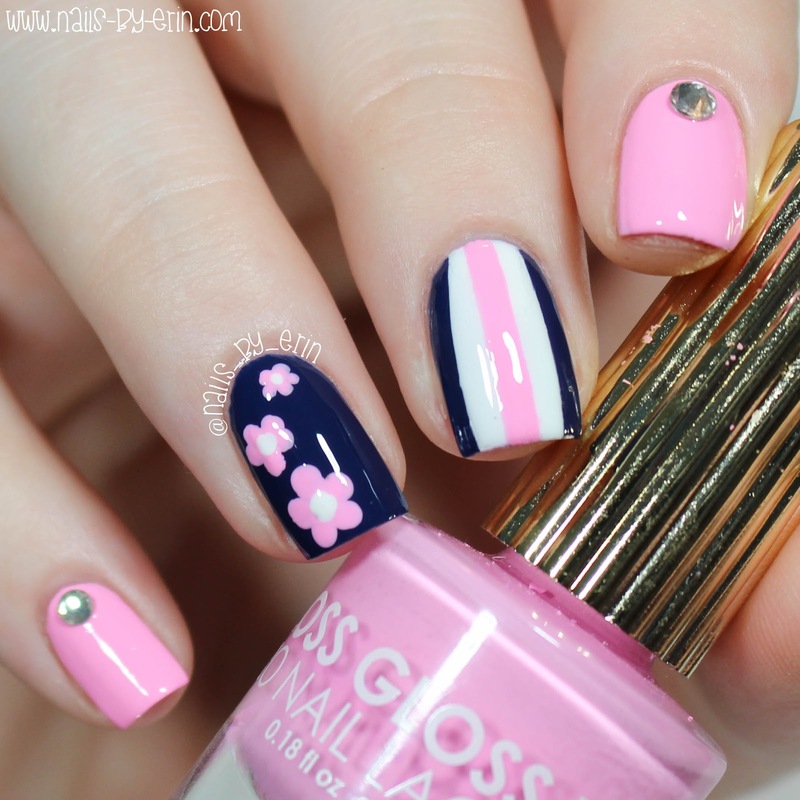 I really loved how fun and simple this floral pattern was, so that's why I decided to include it again in this mani. I'm very happy with how this design came out! Even though it is simple, it is girly and cute, and I feel like the simplicity makes it more wearable. Be sure to check out this watch here on www.danielwellington.com!